You are currently browsing the tag archive for the ‘tree vandalism’ tag. Tree number one – taller than a two-storey building. It used to look as lush as the tree behind it. This is a fine example of tree vandalism on Liberty Street Stanmore. Many thanks to the person who wrote & told me about it. Two mature trees both dead. I didn’t need to look hard to see the drill holes, which were plugged to keep the poison in & I presume to camouflage the holes. There are four street trees along this block. It goes – one dead tree, one living tree, one dead tree, one living tree. Perhaps the vandal thought to confuse us or just had a natural sense of rhythm. I don’t understand why anyone who would do this, except to say they are selfish. The loss of these two trees will have a negative impact on the community. This is a busy road & all the trees along here work hard to remove particulate matter & improve air quality. I ask Inner West Council to replace them in the next planting season please. If those trees get vandalized, plant again. At some stage this council needs to consider CCTV in places where public trees are repeatedly vandalized. Kill that red flowering gum tree! Here is the red flowering gum in 2016 – short, but bulky. Here is the same tree in February 2017 after being vandalised. A dead Brushbox is on the right. A close up of the vandalised tree. You can see that branches have been twisted and ripped off. Around 5-6 years ago, Marrickville Council planted some red flowering gums along the verge on Livingstone Road near & in front of Marrickville Park. At the time, I was very surprised as I think Council rarely plants flowering gums. Imagine if the streets were full of flowering gums instead of those awful weed trees Evergreen ash (Fraxinus griffithii), with their hundreds of thousands of seeds per tree. 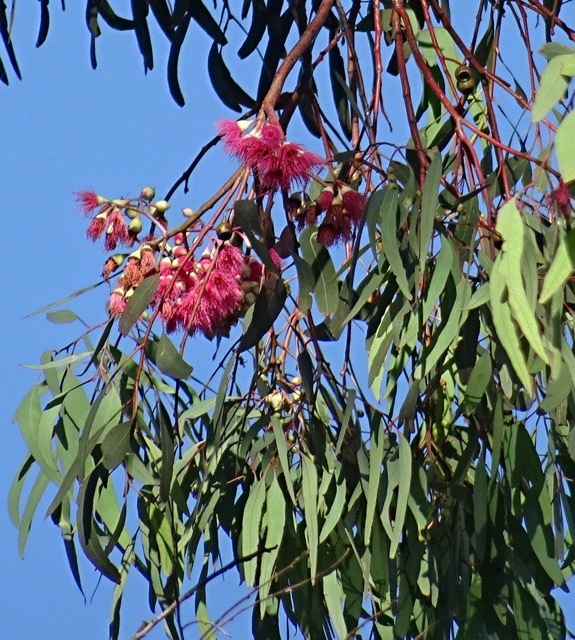 Flowering gums come in orange, hot pink, soft pink & red flowers & are food producing for nectar-eating wildlife. They are a short stature tree & perfect for under powerlines. Unfortunately, Council was ripped off as these trees were the ones that only grow to 1 – 1.5 metres & over a very long time. I do remember there was talk about removing them in one council meeting, but that did not go any further. Every year these trees would burst into flower & look terrific. Every time I passed I looked for them to assess their growth. 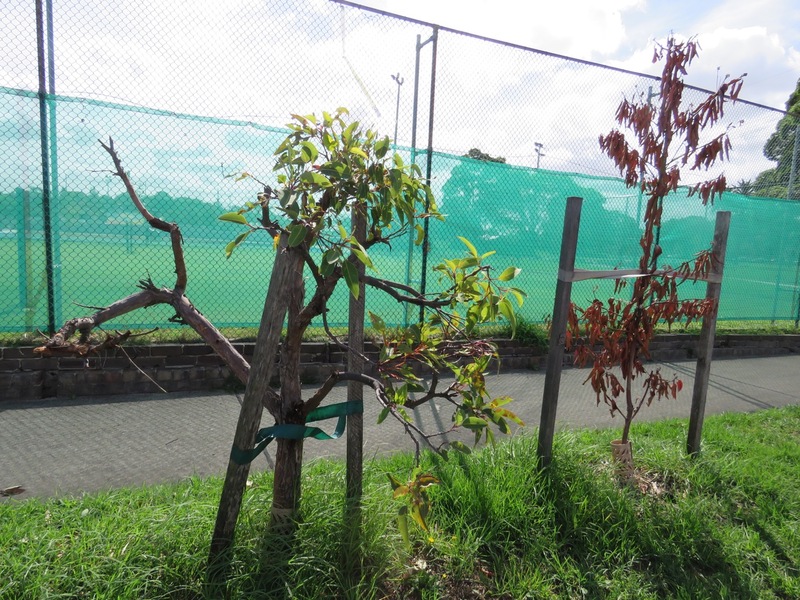 Last year Council planted six Queensland Brushbox trees outside the tennis courts on Livingstone Road in-between the flowering gums. I thought this was wonderful. Brushbox trees grow tall, look lovely & have a great canopy. This is the side of the road without powerlines so they could grow & eventually could create a visual link to the mature Brushbox trees in Marrickvile Park. Unfortunately, only three of the newly planted Brushbox trees survived. It may have been the extraordinary heat over the summer. Who knows. A few weeks ago I saw that the biggest red flowering gum, a quite substantial shrub really, had been vandalised. Someone had twisted & ripped off all but one branch. It must have taken them a great deal of strength & energy to do this because the branches were quite thick. Yet another public tree lost to an antisocial vandal who is against the public interest. 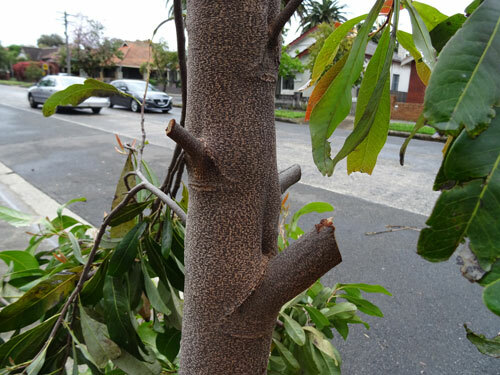 If I feel frustrated at the amount of tree vandalism that happens in the former Marrickville municipality, I think Council must be either pulling their hair out or numb with fatigue witnessing the destructive things the happen in public spaces. There are some in our community who go out of their way to destroy any beauty in public spaces. They would not pick up rubbish or pull weeds out from the verge or footpath as “this is council’s job,” but they think they have a right to vandalise or destroy a street tree because it is in front of their house or planted in a place they think a tree should not be. I have heard people express this sentiment a lot & I’ve never understood the contradictory personal ideology that creates it. At last count in 2012 the former Marrickville municipality had 22,608 street trees & I doubt this number has changed much. 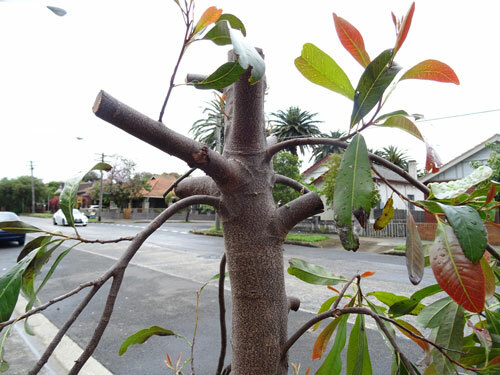 I can say with complete confidence that at least 10 street trees are vandalised & killed each year just in the suburb of Marrickville, not the whole former Marrickville Council municipality. It takes at least a decade for most newly planted trees to start providing any real benefits in terms of shade, carbon sequestration, pollution uptake & oxygen output. The twenty years is needed to allow the tree time to grow into a decent size. Anyway, Council has removed the three dead trees & the vandalised gum. When looking at my photos tonight I realised that I had a photo of another flowering gum in this particular block & that too has been removed. Maybe it was also vandalised. So that is five dead or vandalised trees in what is the space of 40-metres. Not bad hey? Showing 5 of the 6 newly planted Brushbox trees and TWO red flowering gums. It was only after looking at these photos did I see that there was another red flowering gum alive and well here and this too has been removed. Maybe this one was vandalised as well. The second gum is behind the second staked tree on the right. Showing the tree death in this location. 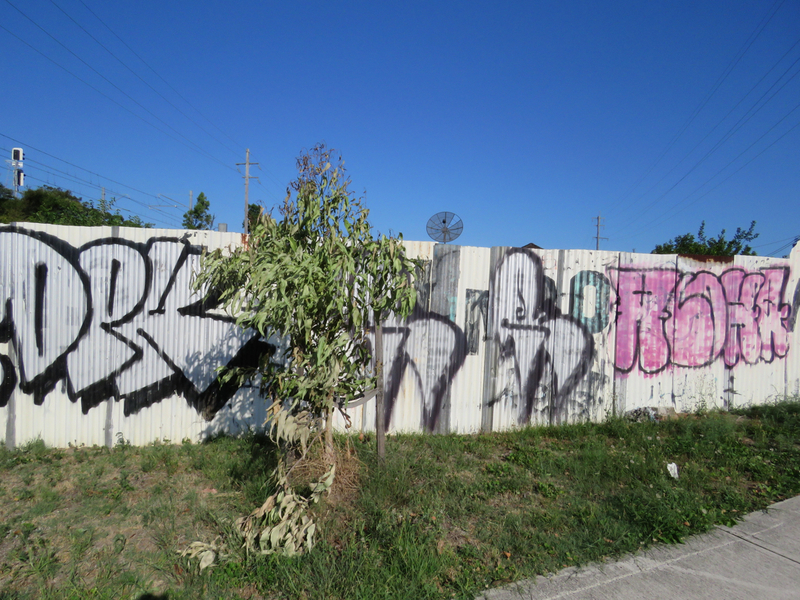 Three Brushbox in a row died and one red flowering gum was vandalised. One other small gum tree has also been removed bringing the death count to five. Tree in Morton Street Lewisham, adjacent to Gould Street. Towards the lower left you can just see a vandalised tree. 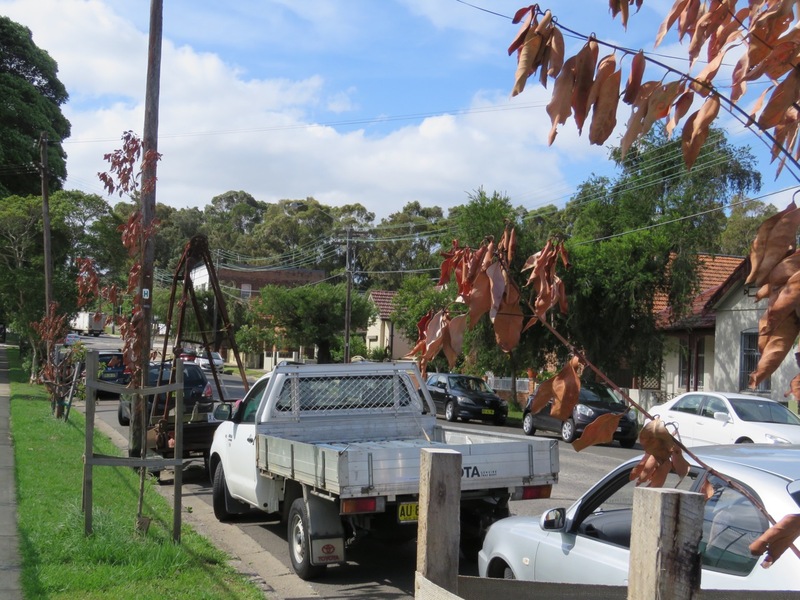 Marrickville Council has given notice of their intention to remove a Narrow-leafed Red Ironbark (Eucalyptus crebra) adjacent 49 Gould Avenue Lewisham. The tree is actually on Morton Street. It had no Notification of Removal sign attached. “Tree has significant level of canopy dieback & deadwood & is in an advance state of decline. I feel very sad about this tree because half the canopy is alive & filled with flowers. As a result, it is also filled with feeding singing birds. It will be a big loss for local biodiversity. 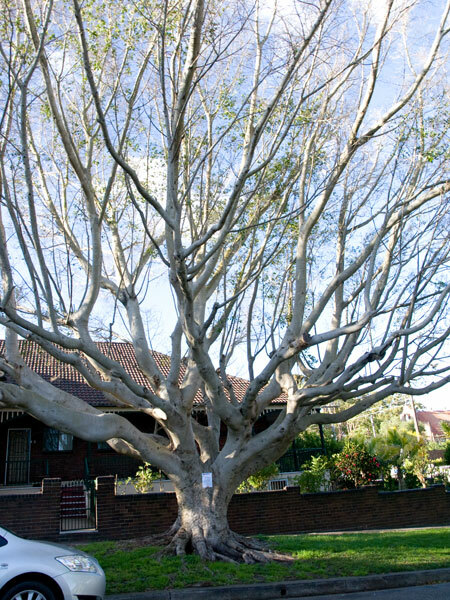 Council says they will replace this tree with a Jacaranda (Jacaranda mimosifolia) before September this year. The deadline for submissions is Friday 6th May 2016. Half the canopy is filled with flowers. 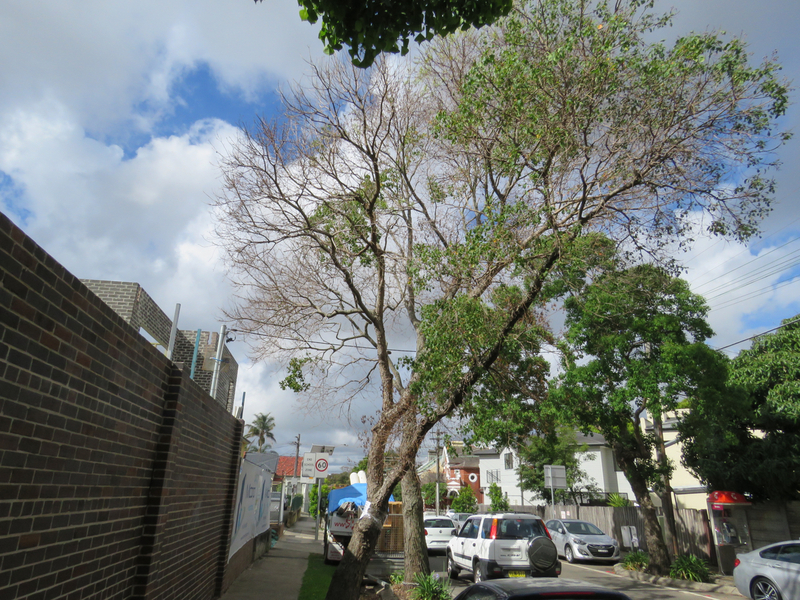 Within a few metres between the tree to be removed & Gould Street is a vandalised tree – presumably a Jacaranda. I hope the new replacement tree does not meet the same fate. I also hope this tree is replaced. Vandalised tree in Claremont Road Burwood Heights. I love that the tree has been left in place with a sign saying it has been vandalised. The orange sign of the vandalised tree can just be seen in-between these two fabulous street trees. The vandalised tree would have likely looked like this beauty. Such a shame. Its loss to the community is considerable, not only in terms of dollars, but also in amenity. 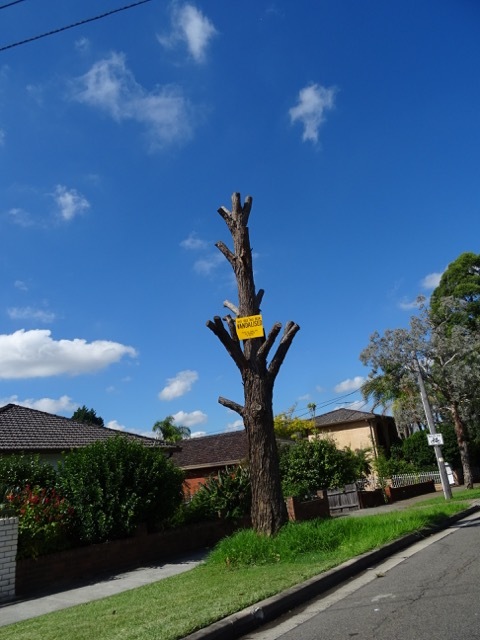 Kudos to Burwood Council for attaching a large metal yellow sign saying, “This tree was vandalised” on a street tree in Claremont Road Burwood Heights. The ten-metre trunk has had all branches removed for safety & just left there. 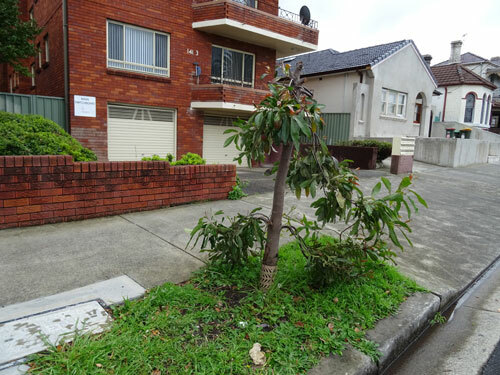 I assume Burwood Council has left the tree in situ so not to reward the vandal by removing the tree. Every day this tree trunk & sign is seen by hundreds of people who drive by, further educating the public. 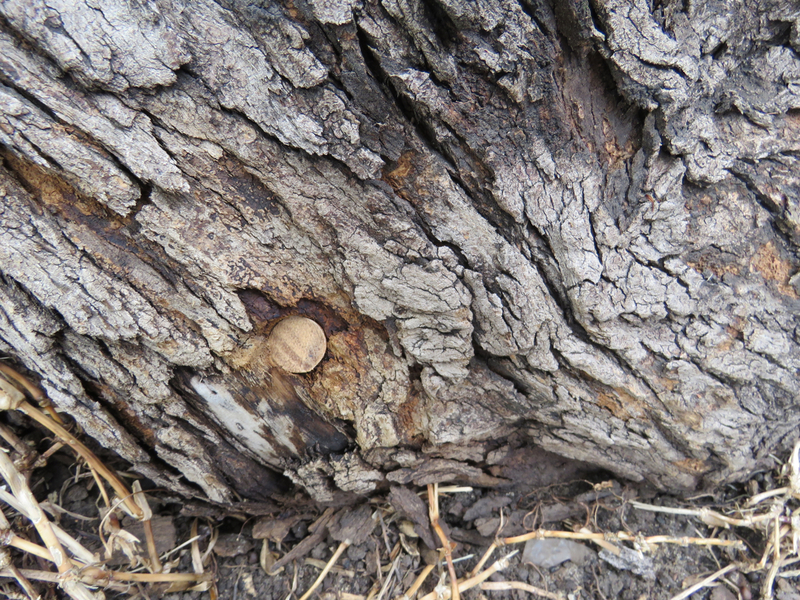 It is hard to catch tree vandals, but not too hard to make them live with their actions. Claremont Road has a number of beautiful tall trees that look wonderful. I think they are Tallowwood trees (Eucalyptus microcorys). This one stands alone – a poor sentinel to the ignorance & selfishness of someone in the community. I hope they & others like them come to understand the benefit of trees for the whole community sooner rather than later. Everyone loses when public trees are vandalised. You don’t need to be living close to the tree to be impacted. 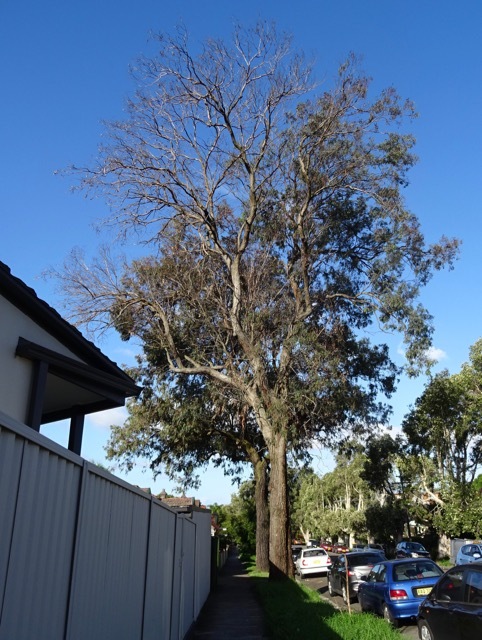 A Sydney Red gum is the latest tree to be poisoned for views in Carradah Park in Larkin Street Waverton. This is despite the effort to which North Sydney Council went to work with the community to choose suitable planting sites for the trees. Nature-hating vandals have killed 19 of 20 trees planted in 2004 in this park. That is phenomenal disrespect for the trees, the environment, the rate-payers & their neighbours. It is wonderful to see a local council take tree vandalism seriously. No namby-pamby utterances like, “this is a disgrace” & then quietly chopping down the vandalised tree to replace with the hope that the new tree is not vandalised or worse – giving in to the vandal & not planting a replacement tree at all. 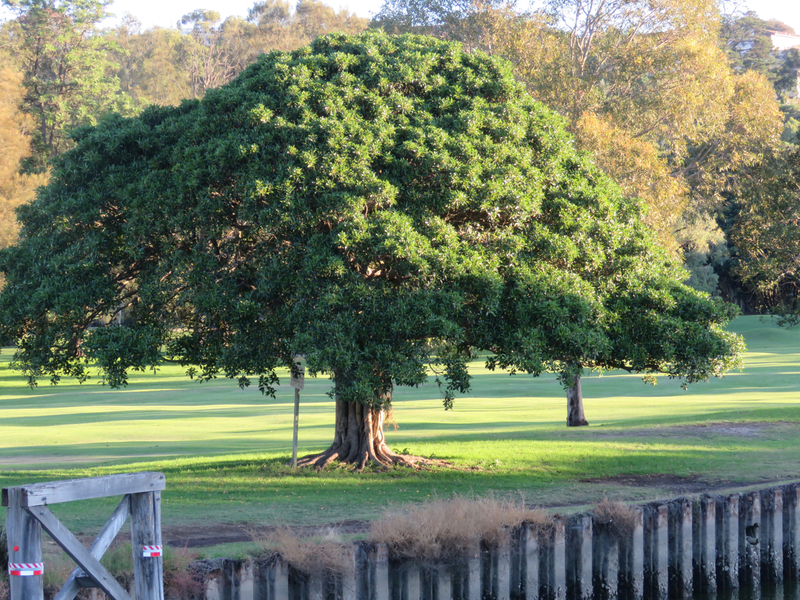 I applaud North Sydney Council for taking action that strongly affirms the community’s disapproval of tree vandalism. They have installed a big ugly sign in eye-catching red black & white with large letters saying, “WARNING. Trees in this area have been willfully destroyed by selfish vandals.” The sign goes on to offer a $10,000 reward for information & also warns that if convicted, the vandal faces a fine of up to $1.1 million. The council has also left the dead trees in-situ. Let the vandal look at the great view through a big ugly red, black & white sign & a dead tree. I can guarantee this irks their sensibilities every time the look out over the glorious view of Sydney Harbour. I hope the council doesn’t cave in when requests start to come in to remove the sign & the dead trees. To have meaning, both should stay for years. Dead trees can be made safe & they offer enormous benefits to wildlife, so there is not reason not to retain them. 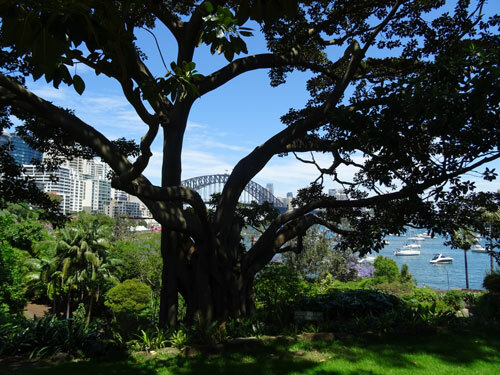 This magnificent fig tree in Clark Park Lavender Bay enhances the view of the Sydney Harbour Bridge in my opinion. The view around and through the tree would change as you move from window to window. Very few people want a treeless harbour. They want the beauty that trees bring, plus the many other benefits. It’s only the nature-haters that want to destroy the outlook for everyone else. 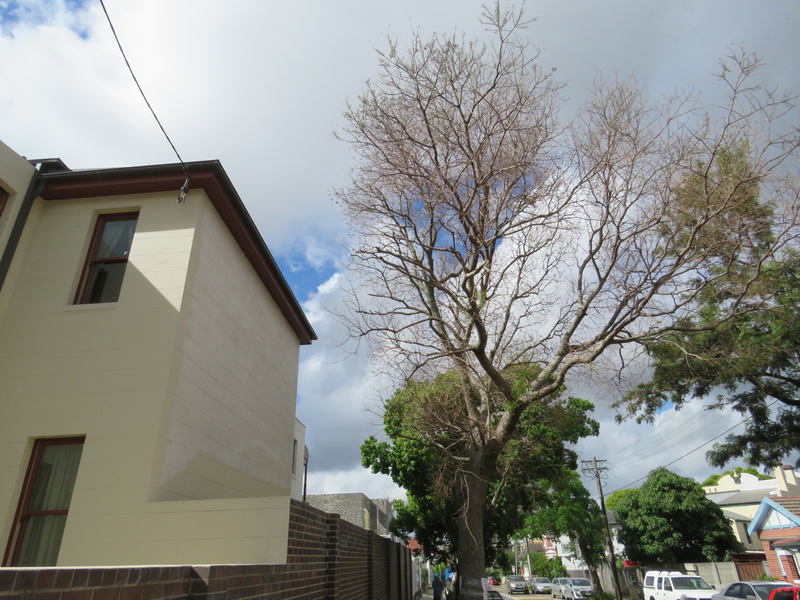 This and one other Hills Fig trees in Margaret Street Dulwich Hill were poisoned by person/s unknown. Photo taken 2011. It’s not just newly planted trees that are vandalised. but mature trees as well. That is a loss of $40,000 to the ratepayers of Marrickville municipality. It is also a loss to our collective future in terms of streetscape beauty, better mental & physical health, happier kids, cooler streets, more pleasant walking experience, birds in the area, pollution uptake & better air quality. Trees bring more benefits & you can read some of these in the page called ‘100 tree facts’ above. 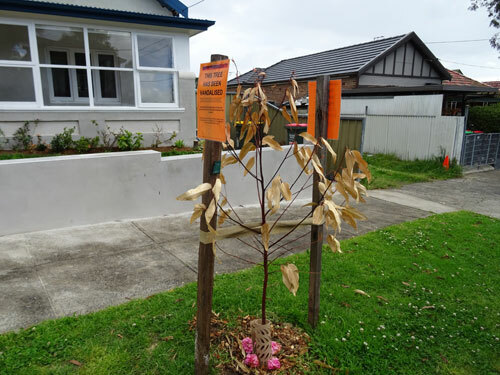 This year Marrickville Council has been attaching a bright orange sign to the stake of vandalised trees that says, “This tree has been vandalised.” I applaud Council for this initiative. Unfortunately, I have seen more vandalised trees that do not have the orange sign attached probably because Council has not seen them yet. I think another 20 trees could comfortably be added to the vandalised list. She also suggested that Marrickville Council engage in better community consultation before any tree is planted by negotiating with residents regarding what trees they like & answer any of their questions. She felt this approach might prevent newly planted street trees from being destroyed. I agree with Ms Langford. The current way is not working. The problem is more community consultation means more cost to Council, which likely means less budget for tree planting, & once again, the greater community loses out to the tree vandals. Council says they have done extensive community consultation with the formation of the Street Tree Master Plan passed last year. It’s true. To their credit they did, but many people (including myself) are not happy with the species chosen for their street & that may push some residents to take matters into their own hands. I would guess that more than 90% of the community did not read the Street Tree Master Plan, so when one tree species is planted & they prefer an another, then the trouble starts. The Master Plan was a huge document & one needed to have knowledge of tree species to fully understand the document. I spent a great deal of time googling Latin names to find out about the species planned. It is almost a given that if I start photographing a street tree someone will race out of their house & ask if I am from Council. When I say no, they start telling me how much they hate the tree I am photographing. I have spoken to a significant number of residents about their street trees & can say with absolute confidence that deciduous trees are hated the most, despite the sunshine the lack of leaves in winter. Why? – because leaf litter makes them angry. They hate leaves all over their garden, over the footpath & in the gutter. They also hate fallen leaves on their car. 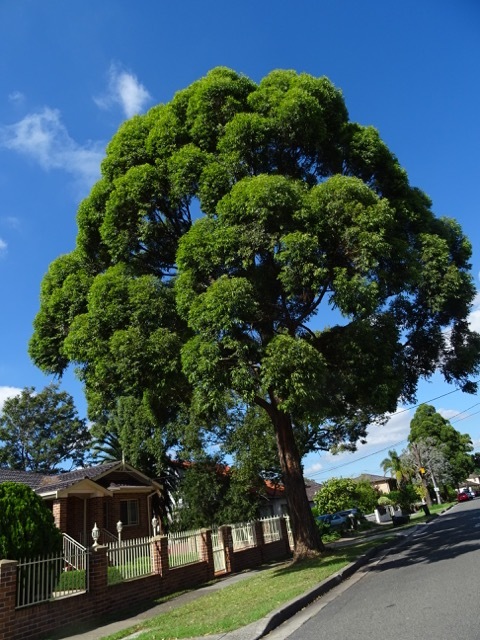 Community consultation conducted by Marrickville Council in 2013 revealed that a whopping 20% did not want street trees in the Marrickville Local Government Area. Not just their street, but the whole of the municipality! This attitude is what Marrickville Council has to overcome & it needs more than articles in the newsletter ‘Marrickville Matters,’ even though these are good. 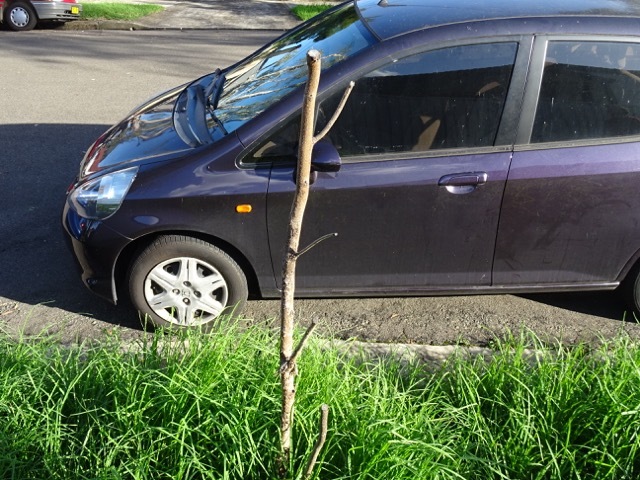 I suspect that hotter streets & homes caused by climate change will help change attitudes, but by then, Council will have to do what other local councils across the world do & that is ask residents to regularly water new trees well beyond the 2-years needed for newly planted trees. I doubt that will go down well. I want to say to the vandals – stop being so selfish! You bought the land that your home sits on, but the verge is not yours. It belongs to the ratepayers of Marrickville and Marrickville Council works on their behalf to make this municipaility a better place to live & they are doing a pretty good job of it. Do something to make it beautiful, not something that destroys beauty. I was extremely interested to watch the uproar around 3-4 years ago when Council canvassed the idea to save $2 million per year by ceasing to mow the verges, except for those residents who were unable to for some reason. A sufficiently large percentage of residents did not want to mow the 5-10 metre strip (on average) in front of their house, so the idea was dropped. 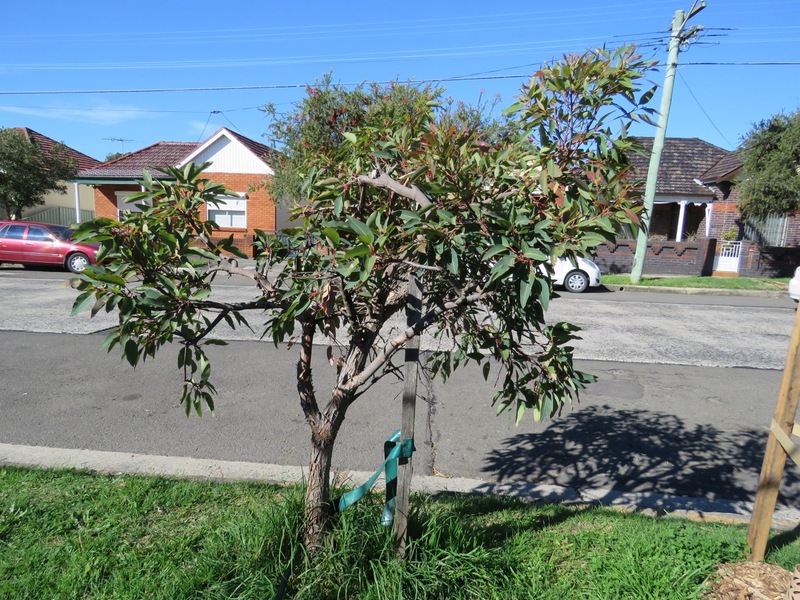 Council is expected to mow, remove litter/weeds/leaves & to make the streetscape beautiful. Yet some think that they can decide that a tree should not be planted outside their property or in the next street at the expense of everyone else. I don’t understand this. Each time a person vandalises a tree, they are stealing from the community & preventing life improvements for future generations. It takes a long time before a tree grows sufficiently to be making a positive impact on air quality, carbon sequestration, shady beautiful streets etc. Marrickville Council’s tree planting budget only goes so far & it might not cover replacing the vandalised tree the following year. A year is a long time when you consider how long it takes trees to grow. Another kind of tree vandalism is when the street tree is pruned so that it never grows & this is very common across our municipality. A 1.2 metre or less street tree will never produce benefits to people or to wildlife. What to do? I don’t know, other than embark of a huge & costly campaign to educate the community about climate change & the need for trees, plus the benefits trees bring. Sydney Water recently engaged artists to paint the walls of their buildings along the Cooks River. All the images are blue representing the water & they all contain large images of waterbirds. Immediately the viewer is led to appreciate the river & the life that lives along it. 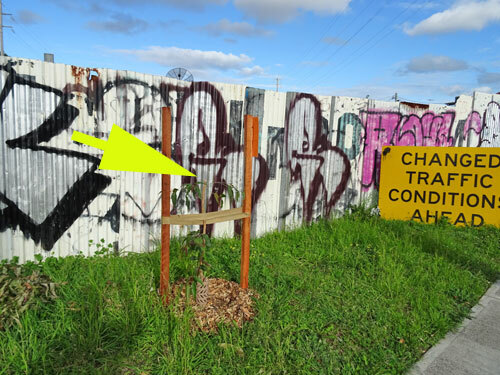 Canterbury Council attaches large steel signs to the tree that says, “this tree was vandalized” & they leave the signs there for 5-years or more. This is a more confrontational approach, but I agree that ugliness is a great deterrent for any future vandalism. Overseas local councils put a shipping container or some kind of structure in place of the tree & leave these for 5-10 years. Our community should not need these approaches. 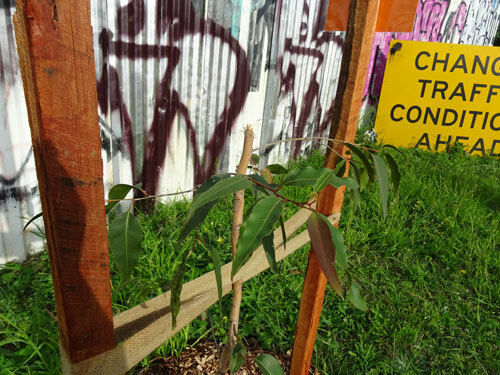 Newly planted Eucalypt in Myrtle Street Marrickville vandalised. This is a perfect site for this tree. Another incomprehensible act of vandalism. The vandalised tree. I hope Marrickville Council plants another in this location. I came across yet another vandalised street tree in Marrickville yesterday. This one is in Riverside Crescent. Another $1,000 of ratepayers money wasted. 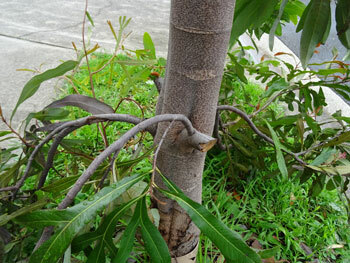 I was pleased to see that Marrickville Council has attached signs saying that this tree has been vandalised. The more attention given to this kind of destruction of public assets, the better. 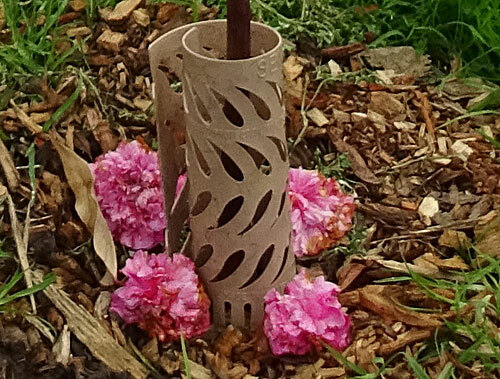 Someone has laid 4 flowers at the base of the tree – a public expression of grief at the senseless loss of this tree. I liked seeing this. 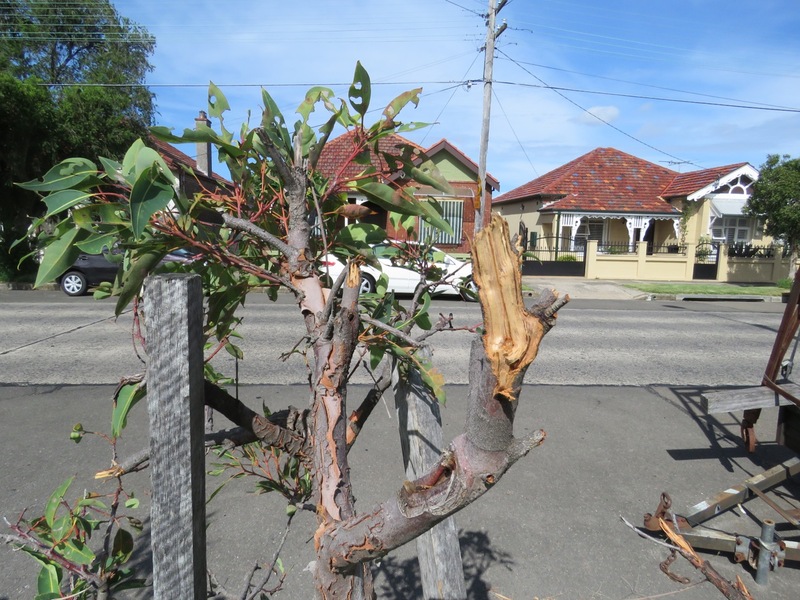 Eucalypt vandalised outside 141 Livingstone Road Marrickville. No stakes and judging by the size this tree was planted in 2013 or 2014. What a stupid loss. Secateurs to mulitple branches at the top of the tree. Secateurs to mulitple middle branches. What is wrong with people? Why do they think it is their right to vandalise public trees? Why do they think it is okay to remove or vandalise street trees that the community has paid for? The verge is owned by Marrickville Council. The street trees are Council property, which also means they are the property of the ratepayers, as Council essentially works for the community to make our lives better. However, just because they are collectively owned, does not mean that it is legal for a person to remove or willfully damage a public tree. Each street tree costs a whopping $1,000 to get into the ground. Larger trees probably cost more. Therefore, tree vandalism is stealing from the community. Marrickville municipality’s urban forest canopy is currently deemed ‘poor.’ It will take considerably longer for Council to increase our urban forest if people keep vandalizing & killing public trees. The beauty of our streetscapes depends largely on street trees & landscaping. While tiles on footpaths do make looking down nicer for pedestrians, they cannot be seen unless standing on top of them or from nearby. Most people do not like ugly streetscapes. 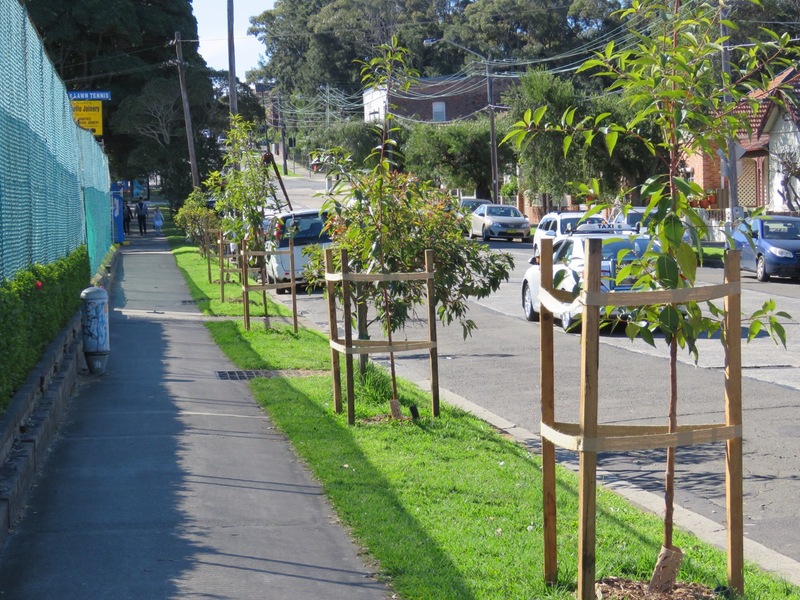 Marrickville Council is working to improve our streetscapes by removing concrete, creating verge gardens & by planting street trees. We all benefit from this. Please grow a conscience & stop vandalizing public trees. They are not your property to do with as you please.